Low double bass fifths crescendoed to spooky chords in viola and violin, with clouds of glissandi and seagull noises and woodwind chatter creating beautiful sound-painting coaxed into a satisfying arc of sheer elemental power. The composer conjures vivid atmospherics with exotic percussion and eerie string bends, yet the abstractions are inviting rather than jarring. The almost inaudible low rumble of the orchestra builds to a sonic density, flares then vanishes, the receding lower strings still humming. Premiered February 8, 2007 by the USC Thornton Symphony under the baton of Dr. Donald Crockett as part of the annual New Music for Orchestra concert. Green Flash was awarded a 2007 BMI Student Composer Award and was chosen to be read by the American Composers Orchestra in their 2008 Underwood readings and was awarded the 2008 Underwood Commission. Green Flash was selected as the winner of the 2009 ASCAP Rudolf Nissim Prize, was a finalist in the inaugural University of Oklahoma 4x4 Prizes, and was the winner of the 2012 Symphony in C Young Composers' Competition. 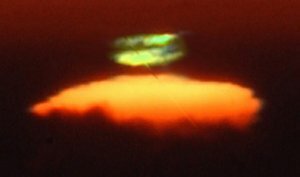 A green flash is a rare atmospheric phenomenon that occurs as a sunset reaches its end. If conditions are just right, then a spark of green will hover on the horizon for a fleeting moment as the sun disappears. I first witnessed this subtle effect in Florida a year and a half ago. Seeing this mythical event for the first time inspired this composition. Green Flash is a musical journey from daybreak to sunset. It focuses on the manipulation of colors and textures throughout its five sections. The musical events are designed to paint a picture of various scenes during the day. The piece begins with the heartbeat of the world emerging from the silent darkness of the night. As night transitions to dawn, waves of color propagate from the repeating low Cs, building up through the harmonic series to become the vibrant colors of the sunrise. Eventually all twelve notes of the chromatic scale are sounding together. Abruptly, a morning fog engulfs the scene. Out of the mist rises the only melodic theme in the work, played by a solo English horn, and later taken up by other solo winds. Once the fog dissipates, the sky fills with the playful dance of wispy cirrus clouds. A rainbow-like halo surrounds the sun, adding a burst of color to the scene. This carefree, optimistic cloud dance is invaded by a menacing front of cumulonimbus clouds. A storm rages at a frantic pace, but in its dying breath yields the most glorious of sunsets. Only as the last glint of sunlight disappears below the horizon, a faint sparkle of green lingers in the atmosphere. Green Flash is published by the Theodore Presser Company. To purchase scores or rent parts, please head to their website.